Max and NeoTM Dog Gear is named after my dog Neo and my brother's dog Max. Both dogs lived happy lives in Arizona. When Neo passed away, I began fostering rescue dogs. It became apparent to me that running dog rescues required alot of resources in both time and money. Max and Neo Dog Gear was started to help dog rescues with their never ending need for dog supplies. Great for running, jogging and walking with your dog. Our hands free leash is great for giving you and your dog some space to move. The bungee absorbs some of the shock when he pulls a little too hard. The leash has reflective stitching on both sides to help you both become more visible as the sun goes down. The belt portion features easy adjustments for all waist sizes. The leash clip can move around the belt easily giving your dog freedom to run around. The leash has dual handles for those times where you need to have more control. The bungee absorbs the shocks and keeps you from getting pulled abruptly. 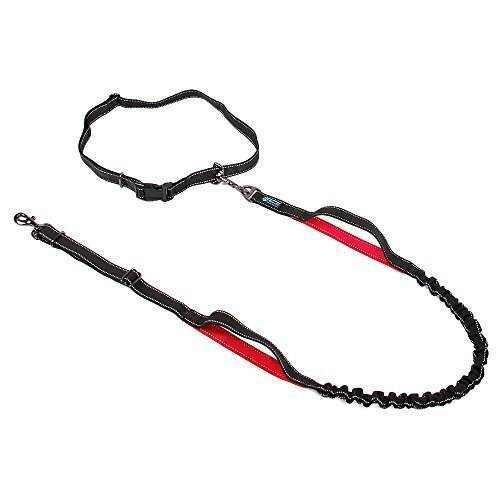 And lastly, the leash is adjustable from 53"-61" giving you the option to give your dog as much or as little lead as you desire. And as always, we donate a running leash to a dog rescue for every one sold. YOUR PURCHASE HELPS A DOG RESCUE: For every leash sold, we donate an identical leash to a dog rescue. Dog rescues are in constant need of dog supplies. We donate 1 for 1 for every purchase. By purchasing one of our dog leashes, you receive a premium high quality leash and you donate one to a rescue. Together we can support dog rescues with a never ending supply of leashes. DOG RESCUES: Each month we donate to different rescues throughout the USA. At the end of every month, we tally up the number of leashes and collars sold. Based on the number, we determine how many rescues we can donate to for that month. We donate down our list of rescues until each one has received a donation and then we go back to the top of our list. In special cases, we will donate to rescues out of turn based on their immediate needs. GREAT FOR RUNNING, jogging, hiking and walking with your dog. Our hands free leash is great for giving you and your dog a little running space. The bungee absorbs some of the shock and provides a little give when he pulls a little too hard. The leash has reflective stitching on both sides to help you both become more visible as the sun goes down. QUALITY CONSTRUCTION: The leash is made of 1" wide x 2mm thick nylon and has dual handles for those times where you need to have more control. The bungee absorbs the shocks and keeps you from getting pulled abruptly. Reflective stitching increases your visiblity to automobiles while running. ADJUSTABLE: Our leash is adjustable from 53" to 60" giving you the option to give your dog as much or as little lead as you desire. If you have any questions about this product by Max and Neo, contact us by completing and submitting the form below. If you are looking for a specif part number, please include it with your message.